Healthy Oils >> Vitality Functional Medicine - Vitality757.com Vitality Functional Medicine - Elevating Energy & Life! When the word “fats” is used in regards to nutrition, it most often has a negative connotation. And in regards to trans fats, the negativity is warranted. Therefore, it is first important to make the distinction between the different types. The “bad fats” are trans and commercially hydrogenated fats. When processed by the body they are rarely broken down into fully bio-available structures. Therefore, they build up debris and toxicity in places such as the arteries and liver. Over consumption of these “bad fats”, or under consumption of the “good fats”, can be responsible for hardening of the arteries, degenerative joint disease, high blood pressure, high cholesterol, eczema and fatty liver degeneration, to name a few symptomatic health problems. EFA’s, Essential Fatty Acids, are the “good fats” which our bodies need. They are considered essential because they are not manufactured by the body but must be added to the diet as part of its basic nutritional needs to fulfill essential functions to maintain life and vitality. EFA’s play a role in metabolic processes by assisting the conversion of food into usable energy and also by transporting energy and information throughout the body. As the building blocks of hormones and neurotransmitters, they are vital as nutritional support for many primary functions such as natural anti-inflammatory production and proper estrogen/progesterone balance. EFA’s aid in the transfer of oxygen and in hemoglobin production. They also play a role in the control of nutrient passage through cell membranes and they affect growth, vitality and mental state. It is important to rotate the forms of EFA’s to get optimum variety in the diet. Two excellent sources are fish oil and coconut oil. In the past, it was more common for people to obtain hundreds of grams of fish oil from sardines, mackerel and herring. Since these types of oily fish are no longer as common in our daily diets, it is necessary to use supplements. Sometimes, due to toxicity in fish, it is as safe as it once was to obtain fish oil directly from fish products. When supplementing with fish oils, the most economical and efficient supplement comes from natural, stable, purified fish oils. Fish oils are already broken down into the cellular building blocks, so there are fewer metabolic steps required. When purchasing a fish oil for supplementation look for one that has not been chemically modified and has no more than 38% Omega 3. It should also be certified as free of PCB’s, heavy metals and pesticides. Xymogen and Nordic Oils are the only two companies I know of supplying certified clean fish oil. Coconut oil, though containing saturated oils, does not have the clogging effects usually associated with saturated fats. It provides the beneficial properties necessary to make it an EFA. Throughout history, various situations have been recorded in which coconut oil was consumed regularly by the general population, without the negative consequences of cancer, high cholesterol, heart disease and the many health problems supposedly created by other saturated fats. Coconut oil used for cooking, or the whole natural product used as a regular food can provide the necessary EFA’s contained in coconut oil. Using it in its most natural raw state is the best way to ensure obtaining its nutritional benefits. Some benefits of coconut oil include increased metabolism, lower cholesterol, increased immune protection, protection against cancer and anti-aging properties such as a decrease in the wrinkling of the skin. 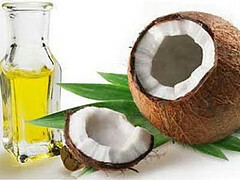 The use of EFA’s such as fish oil and coconut oil can accomplish more than improved health for the present and future. They can actually un-do some damage created by the over use of “bad” fats and the under use of EFA’s in the past.